A purge of sexually charged generation Y frustration through a playful Beckettian round of 20 questions. The allure of disgrace, looks at the loneliness of love and the absurdity of life, in general. 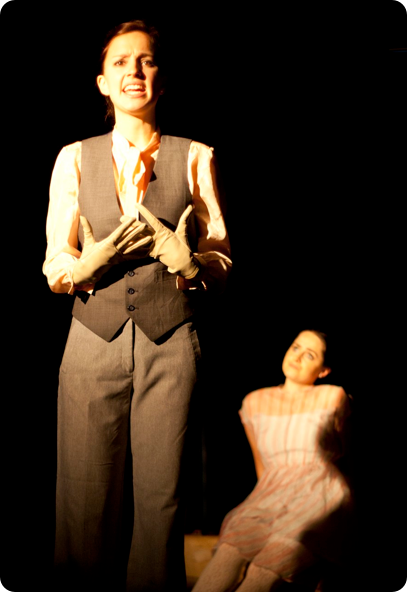 Shown at the Sydney Fringe Festival 2010, The Allure of Disgrace received rave reviews from audiences and critics alike. The play wass the first solely written piece by yours truly. I really loved the idea of writing something as a response to someone else’s work. Not as a sequel, or a re-write, but a response. I read Samuel Beckett’s Waiting for Godot and I had so much respect and admiration for the work, and I wanted to talk to it, to the words. I thought it would be interesting for a young woman, from a different time and country; a different world, to tell her version. It was one of those funny things where you start working on something, not knowing how it’s going to turn out, but it just flows out of you, and you suddenly realize what it is. For me, it became about love. A love I had been waiting for, and hanging on to, only to find it wasn’t there. It can be hard to let go of something , when you have held it for so long. The writing became therapeutic it gave me some perspective, some distance; it provided the closure that I had needed for so long. Written, directed and Produced by Sophie Stone. Cast: Sophie Stone and Kathryn Jackson.